OK. Now that you are looking for flights to Kazakhstan, I assume you've had your Kazakhstan visa issued or have Letter of Invitation (LOI) ready in hand. Right? Right? Right. That's if you a not a Kazakhstani resident. So now how do we find the best flight option to Kazakhstan for you? First we need to know where in Kazakhstan are you going to visit: the south, the west, the east or the north? And where will your departure point be from? We need to start from somewhere don't we? So let's say you are coming from New York and are visiting Almaty, shall we? 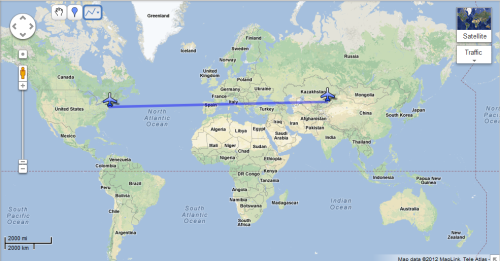 Destination between New York (JFK) to Almaty (ALA) - 6355.26 miles (10227.8 km). Your best flight duration time would be 15.30 to 16 hours. To the left are top flight options from New York to Almaty with only one stop. There are no direct flights from the US to Almaty, you know that, don't you. Please be aware that this information gives a rough idea of how much time it will take to get to Almaty and which airlines fly there. As per the ticket price I can tell that at the time I checked for the flights to Almaty from New York the ticket cost varied from just under $1000.00 to over $3000.00 with some airlines. And again ticket pricing depends on so many factors and mind you it changes quite often. So be patient and do a thorough research when booking your ticket. To get accurate and updated information use this search box and find flights and tickets available from any airport worldwide to ALA Almaty International Airport in Kazakhstan. All you need to do is type in the name of city or airport you are departing from and fill in the dates of your departure and return down below.